Please call the Secretary's Office to make reservations for Pasta Night, Member's Social Night, Dinner By the Sea and other events. They are avaiable during office hours, Monday - Friday: 10:30am - 5:00pm. The Antlergram is a monthly newsletter, except for the December/January combined issue, published by the Westbrook Elks. Now you can easily access the newsletter. All the news you need to know. 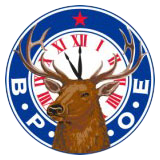 The Westbrook Elks Scholarship awards $1,500.00 each to a male and female who are high school seniors pursuing higher education and exhibit the core values of Knowledge, Charity, Community and Integrity. Participants must reside in the Westbrook Elks’ membership towns: Westbrook, Old Saybrook, Old Lyme, Clinton, Madison, Guilford, Essex, Ivoryton, Chester, Deep River, Haddam and Killingworth. The deadline for this year is Wednesday, April 17, 2019 at 4:00 pm. Join us every Friday and Saturday for Dinner By the Sea. Dinner is available from 6:00 - 9:00. Reservations are required for the Captains Lounge, call 860.399.9191 ext 1 (during office hours). Dinner is also available in the Members Lounge or on the Deck on a first come, first served basis.